An organic farm in the green Tuscany with 110 hectares of land with wheat fields, olive groves, vineyards and sheep from Sardinia. The home-produced olive oil and wine is sold in the agriturismo. There are three apartments and a number of B & B rooms. The location is fantastic, a wonderful place in the quiet part of Tuscany near the fascinating tufa towns of Sorano, Sovana and Pitigliano. The houses in these towns are against the rock walls built and made of tuff. There is plenty of space and good views from the attractively furnished apartments and ideal for people who love peace and quiet. On the grounds of the farmhouse are various Etruscan necropolis of 2 centuries BC and in one of these tombs, the homeowner has a simple wine cellar. The terms of Saturnia, formed in the crater of a volcano, are close to a lovely day relaxing and cures. Lake Bolsena is 30 km away and nice for a swim in the water. 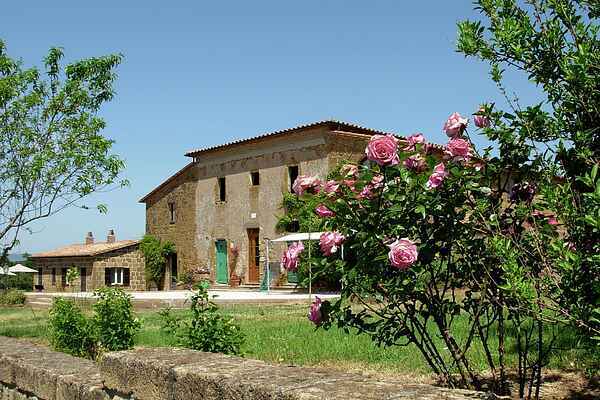 Forget your everyday cares and enjoy this delightful holiday home in Sorano. Apartment Sorano has a private terrace overlooking the pool and garden.